Suffice to say the history of curling is of great interest to all that play the sport however it is a subject that warrants time and attention as a subject on its own and so the research and detail will not be covered here although there are a couple of links provided for those who wish to verse themselves on the subject. Both are passionately interested in the history of curling and you will find the blog brings together all who are interested in the history of this great sport. 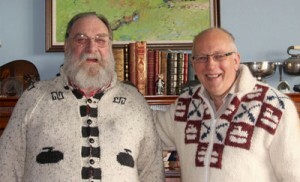 I am sure both David and Bob will appreciate the photo i have borrowed from their site just to show how historical they are. The previous two links have given you an insight to the History of Curling as a sport but now a link to the history of a Moray Province Club. Nairn C.C. is a very active club within the Moray Province and has been for many years. This is a comprehensive and excellent history which also as an aside gives an insight to the Moray Province.